So, imagine you are offered the opportunity to stay in your first choice spot for a volunteer holiday. And imagine it sounds too good to be true, and at the same time, charming and imperfect enough to seem real. And then you arrive and it’s everything you hoped it would be and better. 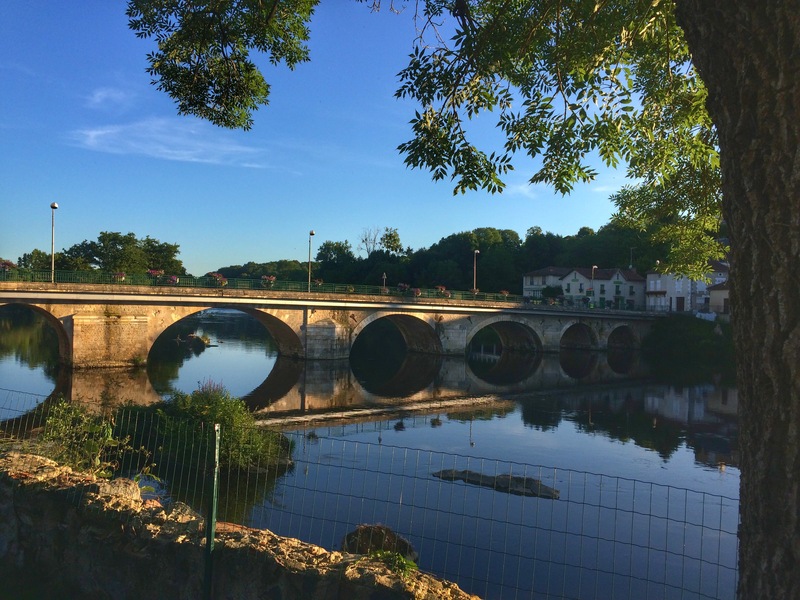 The Plan: spend my summer volunteering in the French countryside. The Process: join workaway.info and search for a host. The Result: connect with a British artist named Corinne who owns a 200+ year old house that she wants to renovate and turn into an international artist retreat, book and take a bus from Paris to Poitiers, and then drive to the small village of Bourpeuil across the river from L’Isle Jourdain, soon to be my home away from home. As Corinne drove along, the view of the countryside and houses reminded me more and more of what I loved in Provence. Terra cotta roofs, sheep wandering across the fields, rolling hills and tiny gardens, brightly coloured doors and shutters, window boxes and potted plants, lavender and sunflowers…. and the sun ever so slightly dipping into the evening sky made everything more than picturesque. 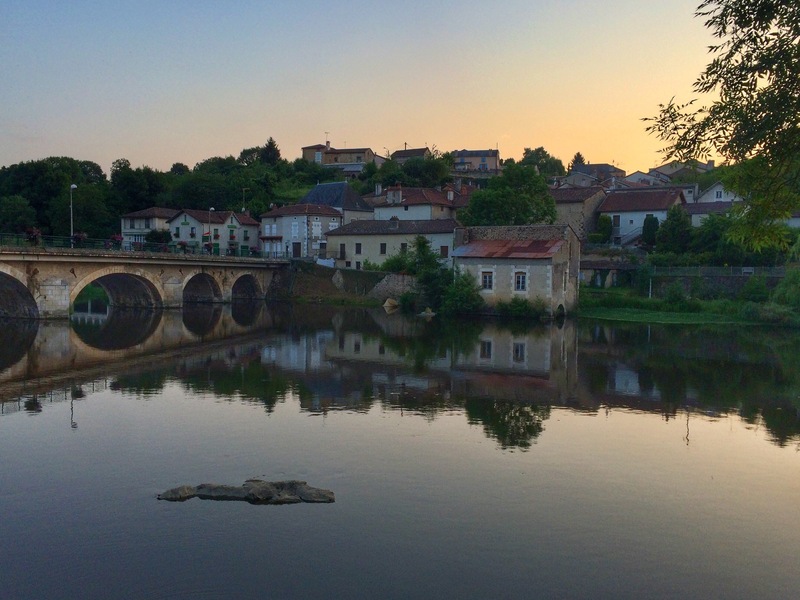 My delight simply grew as we arrived in the small town and I saw the grand viaduct, the town across the Vienne River including a church on the hill, and we pulled up in front of an old unassuming old house. Corinne was already a kindred spirit and I immediately felt further welcomed by her partner Gilles, and their two friendly terriers, Duke and Major. Our first meal (stewed lamb and grilled vegetables and roasted potatoes) was served on the long wood table in the warm and inviting black and white kitchen, one of the most complete rooms in the house. This is obviously the heart of the home, and we have lunch and dinner together here every day. Gilles is a fantastic cook (who reminds me of my dad) and he always has delicious meal ideas, and Corinne loves to cook as well!! Between the two of them we have had everything from pan-seared vegetables and sausages with couscous, moules frites (mussels with fries) with homemade mayonnaise that is so good I actually eat mayonnaise here, to vegetarian curry, beet and chèvre risotto, and the best potatoes au gratin I have every had. Right away I fell in love with the house, my room, my hosts and the dogs. I am the second of three volunteers to arrive this summer; the first is Viktor from Hungary, and soon to join us is Sini from Finland. There is a long to-do list here, from plastering and painting walls and ceiling, tiling, flooring, sewing curtains, and furniture building/reupholstering, to building a terraced courtyard, installing a kiln, and helping furnish and decorate the guest rooms. For the first week every morning after breakfast (and coffee, bien sûr!) I was on painting duty. The old grey shutters on the front of the house had previously been sandblasted and needed priming, rust-coat painting on the hardware and then painted a fresh new colour. The back terrace in painting progress. The finished shutters and doors! (fully furnished house) in the village for friends of our hosts, and we took several loads of items like furniture, clothing, linen and dishes to local charities and also to a “Vide Grenier” to sell some particularly nice/interesting things. A Vide Grenier literally translates to “Empty Attic”. Every village has these big yard-sales/garage-sales once a year, and this one was quite huge and included a carousel, carnival games, a hot lunch, a free coffee and beer for each registered seller, and two football fields of knick-knacks and antiques, artwork, clothing, lamps, toys, and collectibles. Everything you can imagine (including several kitchen sinks)! The neighbors here are all so friendly, and just like everywhere else I have been in France, the small community atmosphere of people is hugely friendly and warm-hearted. Right away we were introduced to a bunch of Brits that have relocated, or retired, or vacation several months of the year here. The most idyllic night so far was spent on the island at the home of Helen and Moyed, and the house that the town is named after. 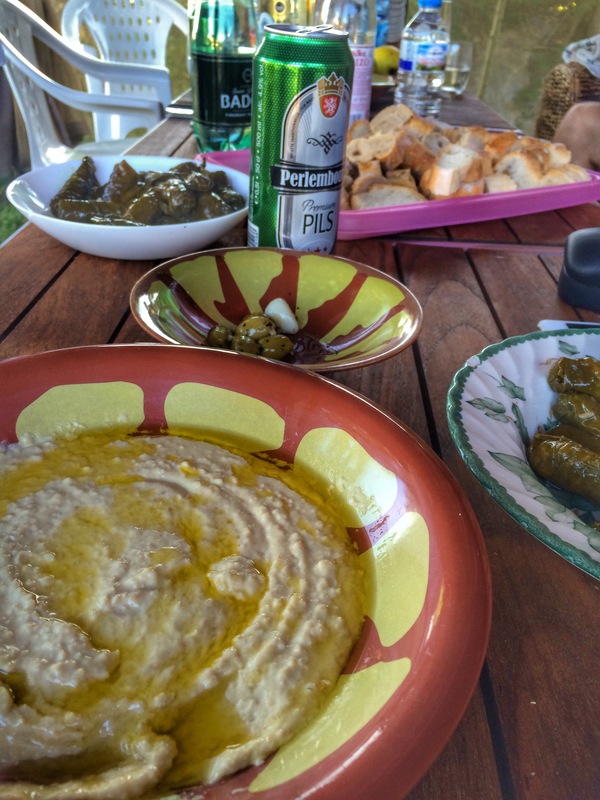 It was a beautiful evening, and the originally casual plan of hummus and bread for a light dinner turned into a huge delicious meal including chips and curry, olives, preserved lemons, dolma, burgers, and plenty of wine and beer. We sat under the tree in their front yard with their pet chickens wandering around, a view of their olive grove, the river, the viaduct, the bridge, and the villages on either side. Heaven. This is Dolly, apparently the queen/guardian of the household. More to come…. This is only the beginning! ← 4 days in Paris and a packed schedule, of course. Sara, please add me to your blog recipients. Love your travelling life in pics and text.